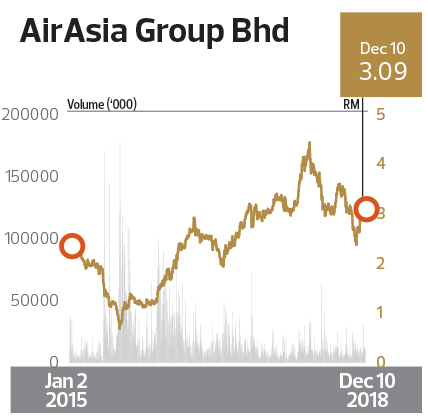 "BIG CAP COMPANIES — RM10 BILLION TO RM40 BILLION MARKET CAPITALISATION / HIGHEST RETURNS TO SHAREHOLDERS & GROWTH IN PROFIT AFTER TAX OVER THREE YEARS: CONSUMER PRODUCTS & SERVICES: AirAsia Group Bhd - Soaring Higher Despite Challe | The Edge Billion Ringgit Club 2018"
AirAsia Group again saw impressive earnings for the financial year ended Dec 31, 2017 (FY2017). The budget airline recorded a net profit of RM1.63 billion on revenue of RM9.71 billion, which is a 42% increase over FY2016. It is the group’s ninth consecutive financial year of profit since it last slipped into the red in FY2008 amid the global financial crisis. The improved revenue was contributed by a 10% year-on-year increase in capacity and an 11% increase in the number of passengers carried to 39.1 million, as well as a 6% increase in ancillary income per passenger to RM49 while its average fare was maintained at RM176, given the planned capacity expansion. AirAsia’s FY2017 net profit charted a three-year compound annual growth rate of over 170%, making it the highest among its big cap peers as well as those in the consumer products and services sector. This remains true, even after a multiplier or penalty of sorts was applied on the low earnings base in FY2014, in accordance with The Edge BRC awards criteria. In FY2014, the group’s net profit attributable to owners was RM82.8 million, and it has since surged to RM1.62 billion in FY2016 and RM1.63 billion in FY2017. The group’s performance was also backed by revenue growth across the countries where it operated during FY2017, namely, Malaysia, Thailand, Indonesia, the Philippines and India. The strong financial performance coincided with the low oil price environment in 2016 and 2017. When oil prices recovered to nearly US$80 a barrel, some analysts had flagged a potential margin squeeze from higher aircraft fuel expenses. At the time of writing, however, Brent Crude was hovering near US$62 a barrel. expansion mode. It received 20 new aircraft in FY2017, adding 17 Airbus A320neo and three Airbus A320ceo, which were financed via asset-backed bank financing and sale and leaseback for tenures of 12 to 15 years. Two Airbus A320ceo that were leased to AirAsia Philippines were returned to the third-party lessors and 11 additional Airbus A320ceo aircraft were sourced from operating lessors’ portfolios to increase its fleet growth to 29 aircraft. In FY2017, AirAsia also saw its first flight in Japan take off, while the groundwork has been done to start up in Vietnam and China. The first nine months ended September (9MFY2018) also saw the continuation of its strong growth as net profit jumped 91% y-o-y to RM2.42 billion. Excluding one-offs such as foreign exchange gains and RM170.9 million net gains on disposal of its stake in online travel agency Expedia, the group’s core net profit declined y-o-y in the third quarter due to higher fuel expenses as well as weaker Asean currencies against the US dollar. Going forward, the Malaysian operations are expected to remain strong with Indonesia recovering gradually after being hit by Mount Agung’s prolonged volcanic activities, the tsunami in Palu and an earthquake in Lombok. As for the Philippines unit, recovery is expected to remain slow following the government’s restriction on travel to Boracay Island. Similarly, the Thailand unit is expected to face challenges following the ferry accident in Phuket, which dampened demand from China. At the time of writing, however, most analysts remained positive on AirAsia’s prospects. Bloomberg data shows 14 analysts with a “buy” call, four had a “hold” while two others said “sell”. The average 12-month target price was RM3.42, indicating a potential return of 9.6% from its share price of RM3.12 as at Dec 7. Nonetheless, the five most bullish analysts thought the stock was worth at least RM4 apiece, with the most bullish valuing the stock at RM5.30. Conversely, the most bearish only values the stock at RM2.40 apiece.